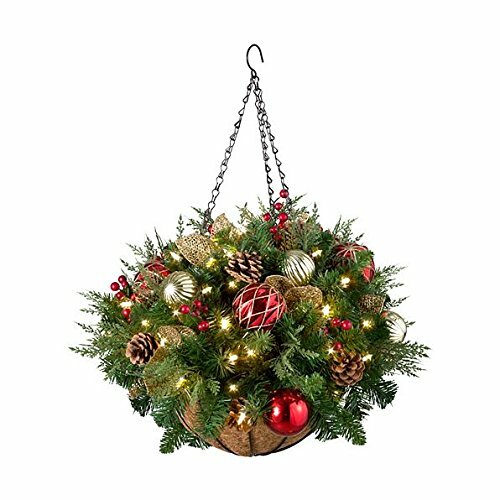 Add a basket-load of holiday cheer with our 18" Pre-Lit Christmas Hanging Basket. Combining classic natural-looking greenery with red and gold shatterproof ornaments, pinecones, and faux berries, this beautiful holiday hanging basket adds elegance and cheer to your home or covered front porch. Hanging Basket has 50 warm white LED lights for an elegant glow. A generous 126 tips lends an abundant, natural look. A timer option lets you set each piece for 6 hrs. on/18 hrs. off. This versatile holiday basket also includes a removable red and gold bow along with a sparkling, weatherproof ribbon. Uses 3 AA batteries (not included). Beautifully made with PVC, metal, pinecones, and plastic. .
Add a basket-load of holiday cheer with our 18" Pre-Lit Christmas Hanging Basket. Combining classic natural-looking greenery with red and gold shatterproof ornaments, pinecones, and faux berries, this beautiful holiday hanging basket adds elegance and cheer to your home or covered front porch. Hanging Basket has 50 warm white LED lights for an elegant glow. A generous 126 tips lends an abundant, natural look.